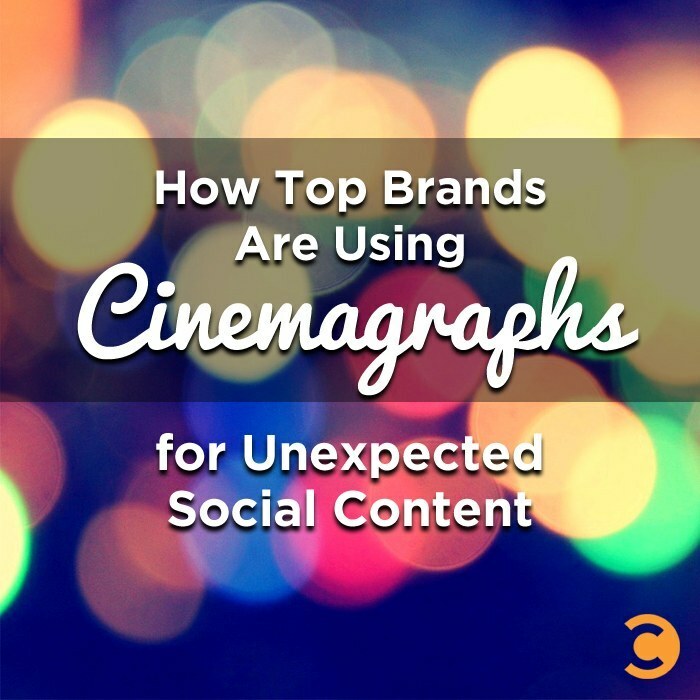 While cinemagraphs aren’t exactly new, more companies are embracing the power of these mesmerizing GIF/video hybrids to generate engagement on Facebook and Instagram. Partly due to their creative nature, but also in response to Facebook’s autoplay video and Instagram’s ability to play videos on a loop, the end result offers a powerful incentive to test this medium in your visual content mix. When done well, cinemagraphs are elegant and eye-catching. It’s unexpected to see one element in motion without sound, surrounded by a still image. Consider this type of visual in a cluttered newsfeed where you have between 2.8-8 seconds to capture someone’s attention, and you can see why more brands are testing cinemagraphs. Despite their creative prowess, the intriguing nature of cinemagraphs has made them subject to debate. Although defined as “still photographs in which a minor and repeated movement occurs,” some prefer to think of cinemagraphs as an animated GIF, while others think of them as a video. However, this visual media is alluring for advertisers, as it brings motion to static images, which are still largely the purview of major social platforms such as Instagram and Facebook, especially when Instagram alone sees over 58 million photos a day. Cutting through the clutter in today’s era of infobesity is harder than ever, and this may be the media that does it—a very tempting prospect for advertisers . So, how are companies leveraging beautiful creative format? Take a look. The original pioneers of the cinemagraph, visual storytellers Jamie Beck and Kevin Burg of Ann Street Studios have created hypnotic images like this one for Lincoln, Armani, Balenciaga, and many more. In looking at this cinemagraph, it’s clear that the format is made for luxury brands. Refined and elegant, the motion of the sparklers that spell out “Chanel” in the model’s headpiece really pops and pulls you into the visual. For more cinemagraph inspiration, check out more of Ann Street Studios’ work here. This cinemagraph is an oldie but a goodie. Originally posted on Coca-Cola’s Tumblr, it’s been re-blogged over 80,000 times. Why does it work? It’s simple but eye-catching with the contrast of the red Coke can and the bright blue water in the background. It also plays well to the lifestyle cues of Coca-Cola. Who doesn’t want to be sipping a Coca-Cola while sitting poolside on a hot day? Never one to shy away from unique visuals, General Electric used a cinemagraph to show the capabilities of its at home jet engine assembly kit. This cinemagraph showcases how a company can use the format to demonstrate a product feature in a way that cuts through the noise and forces the user to focus on it. GE could also use this feature on other more B2B parts of its brand, such as showing a wind turbine in action or a specific feature of a machine working. Introducing #GE’s at home jet engine assembly kit. Made possible by 3D printing, this is the perfect thing for that #AVgeek in your life. Celebrate the beauty of #aviation design with us and enter to win one at artsandaircraft.com! In case you missed it, here’s a special sneak peek sketch of the next-generation Ridgeline that we released at the Chicago Auto Show today. Honda used a cinemagraph to offer a sneak peek of a new vehicle: the next-generation Ridgeline, which the company introduced at the Chicago Auto Show. When preparing for a new product launch, it’s always a good idea to focus on a special creative execution on social media to truly make it stand out. Case and point: this cinemagraph of sketch paired with the animation of the sky causes the viewer to pause and take a second look at the image. Continue the conversation on our Facebook or Google+ pages.